This comprehensive RCRA training courses prepares you to properly identify, accumulate, transport, and dispose of hazardous waste. Tailor this course to your needs by registering for one to five instruction days. Accumulating, managing, and shipping hazardous waste in full compliance with the Resource Conservation and Recovery Act (RCRA) and Department of Transportation (DOT) requires an understanding of requirements that apply at generation, accumulation, storage, transportation, and disposal stages. This annual course delivers a breakdown of current requirements, presented within a context that simplifies understanding. The Hazardous Waste Compliance Manager™ training course provides both beginning and advanced waste generators, handlers, and managers with the tools and understanding needed to master the complexities of RCRA, while avoiding the confusion and faulty interpretations that can lead to regulatory pitfalls. This course incorporates a series of presentations, in-depth discussions, and practical exercises designed to guide participants towards mastery of RCRA. The fifth day provides attendees with the tools and training necessary to prepare and sign your hazardous waste manifest in accordance with DOT hazmat training requirements. Who should attend this RCRA training course? This is the Aarcher Institute’s most detailed presentation of hazardous waste requirements, but the context provided and the opportunity to adjust participation by registering only for selected days makes this course a great pick for anyone with hazardous waste responsibilities. Annual attendance ensures you stay current with changing RCRA regulations and help your company comply with the training requirements under 40 CFR 262.17(a)(7) and 49 CFR 172.704 Subpart H. This course is valuable for EH&S managers, environmental compliance specialists, environmental consultants and engineers, operations managers, and anyone involved in the generation, accumulation, management, or disposal of wastes. What is the format of our hazardous waste training course? The Hazardous Waste Compliance ManagerTM training course presents the framework of RCRA and the specific requirements of its implementing regulations, along with DOT Hazmat shipping requirements. Each day builds on the last as the instructor presents the material using a combination of slide sets, references to reference materials, exercises, and discussions of real challenges faced by others. The class participates in a virtual “walkthrough” of a hazardous waste generating facility. Courses are held in pleasant and easily accessible locations, and training venues are selected to allow you to escape distractions and focus on the presented material in a professional setting. All locations offer wireless service and Internet access so you can stay connected. Because our instructors teach exclusively for the Aarcher Institute, using our exclusive content, course modules are presented in logical sequences and information is not fragmented and does not overlap. Discussions among instructors and attendees explore unique environmental management challenges and proven compliance strategies. All attendees are encouraged to ask questions throughout the course. What does our training course deliver for hazardous waste professionals? The Hazardous Waste Compliance ManagerTM provides participants with a solid foundation for identifying, characterizing, accumulating, and disposing of hazardous waste. Completion of this course ensure you are well-equipped to manage hazardous waste in a manner that is compliant and minimizes risks to your organization. You will be provided with a current copy of the Code of Federal Regulations (CFR) hazardous regulations (40 CFR Parts 260-265) and DOT Hazmat regulations (40 CFR 172 Subpart H); Aarcher handheld reference guides; instructor contact information for future questions; your notes from the presentations and discussions; and an embossed certificate. Day One– RCRA background and context followed by a close look at hazardous waste identification, characterization, and classification, including available exclusions and exemptions that alleviate regulatory burden for some waste streams. Special rules applicable to listed wastes are also addressed. Day Two– Requirements and strategies for onsite hazardous waste accumulation based on generator classifications. Recordkeeping requirements and special rules for accumulation of special waste streams, release reporting and development of a training program compliant with 40 CFR 262.17(a)(7), are also presented. The class takes a “virtual” facility tour to further discussions of waste challenges. Day Three– Hazardous waste disposal procedures and requirements, including manifesting, land disposal restrictions, management of demolition waste, policies and interpretations regarding spills and releases, contingency planning and allowable onsite treatment. Day Four– Advanced compliance concepts and strategies, including waste stream management, proper sampling and characterization, management of spill cleanup materials and debris, a review of recent and pending hazardous waste rule changes, and effective compliance strategies. Day Five–If you sign the hazardous waste manifest, you meet the definition of a “Hazmat Employee” according to the DOT Hazmat regulations. During this day, we will help your company and you meet the hazmat training requirements. We will provide General Awareness training (provides familiarity with the requirements recognize hazardous materials), Function-specific training (how to properly fill out a manifest and prepare your hazardous waste for shipping), Safety training (includes emergency response measures), and Security training (security risks associated with hazardous materials transportation). 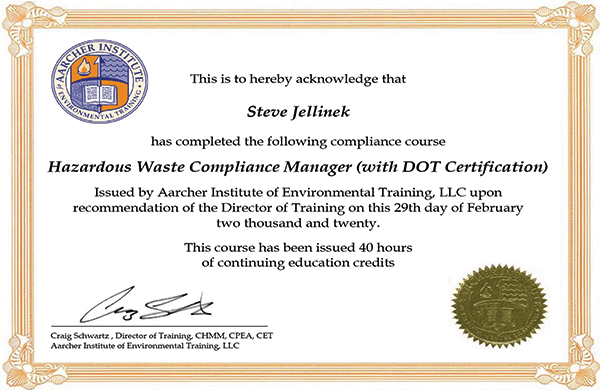 If you maintain professional credentials requiring continuing education credits, this Hazardous Waste Compliance ManagerTM has been approved by all environmental, safety, legal, and engineering certifying bodies. Why choose Aarcher’s training course? This course was developed by practicing hazardous waste consultants who work regularly with commercial and industrial clients. The presented material and example compliance challenges have been continually refined. Instructors have contributed compliance recommendations and insights on various topics. The training materials in this course are owned by the Aarcher Institute and not available through any other source. As we evolve and improve our team, we select our instructors very carefully, just as we do our course materials. Our instructors are highly qualified, practicing EH&S professionals and compliance experts who have been carefully selected based on their regulatory knowledge, relevant perspectives, professionalism, and demonstrated training ability. We are proud of our exclusive instructor team. Taking this course will greatly increase your confidence level by having identified all applicable RCRA requirements for your organization and gaining a comprehensive understanding of RCRA and practical tips to use back on the job. You will receive bound course handout materials, which becomes a useful desk book for later reference. DOT Hazmat Security training: security risks associated with hazardous materials transportation and enhancement of transportation safety. Upon successful completion of the workshop, students can earn up to 36 CEUs. Register for All or Some Days! Robert A. (Bob) LaRosa, PE iis an environmental engineer and regulatory compliance specialist with more than 30 years’ experience supporting federal agency clients and companies in a variety of industries, including chemical, petroleum, transportation, telecommunication, food processing, pharmaceuticals. He is an expert in RCRA hazardous waste management and compliance with experience managing hazardous waste at multiple locations in the US for a variety of industrial and commercial operations and led an effort in 2017 to upgrade and reconfigure the Hazardous Waste Compliance Manager course. He has been involved in continual updates and improvements to the course ever since. Bob is an effective and practiced instructor, with experience delivering more than 60 courses to nearly 1,000 students. Craig J. Schwartz, CHMM, CPEA, CET, is an environmental regulatory compliance specialist, with more than 20 years hands on experience assisting clients achieve and maintain compliance with environmental laws and regulations, including RCRA. He is a Certified Hazardous Materials Manager (CHMM) and a Certified Professional Environmental Auditor (CPEA). Craig has provided environmental compliance support and troubleshooting to more than 250 private companies and federal agencies, ranging from steel mills to the US Army. He has led environmental compliance assistance audits for more than 350 facilities in 42 states, and has been approved by the USEPA and several states as a third-party compliance evaluator. He maintains deep expertise in hazardous waste management and compliance strategies. Craig is an experienced instructor, having delivered more than 50 courses to nearly 1,000 students, and has achieved recognition as a Certified Environmental, Safety, and Health Trainer (CET). Bill Decker, PE, is a registered professional engineer in 32 States and has extensive environmental regulatory compliance experience related to hazardous waste management under RCRA. He has more than 25 years experience evaluating compliance and preparing Hazardous Material & Waste Management Plans and Waste Analysis Plans. Bill has presented more than 30 training courses and bring a hands-on, practical perspective to complex hazardous waste management challenges.